*~Heart Shaped Rock~ * | A Rare Flower*s Pad! ~After a vacation to Ste. Anne de Beaupré Shrine, in our Fifth Wheel camper, my husband and I stopped for a two day's rest at a campground in Rivierè-du-Loup, Canada, called La Pointe. This campground sits on a huge rock mountain like- next to the St. Laurence Seaway, about five miles from Le Cénacle, and is about an hour and a half drive from our home. We were very tired before our vacation and even more so from site seeing in Quebc City and the Shrine of Ste. Anne de Beaupré. We registered and were given a parking site overlooking the city of Rivierè-du-Loup, and that site was right next to a family who were camping in tents, that afternoon there was no one at that site, so, we rested fully until supper/dinner time. Then the family arrived, they were six in all. They were preparing their dinner and my husband chatted with the father while cooking our supper/dinner too. Then, eight oclock arrived and so did the friends and family members who lived in the area, it was plain to see that the family was on vacation and their family members who lived in the area had come to see them at the campground. A campfire was lit, beer cans were opened, the car's radio was put up full blast so they could hear it from inside the car, they opened the car doors on their side- and then the noise of a very happy family/friends reunion began to full swing, some were leaving and some were arriving on a regular basis. After a while my husband went to sit outside by the campfire and all of a sudden their radio volume was put down. "That was very nice of them", I said to my husband when he came inside the camper. But, the laughing and slamming of the doors noise went on to passed 11 PM, some left the party and some stayed passed 1 AM. The noise of the doors of that family car, and the other cars were more annoying than anything else. My husband and I could take the fun time they were having, but the constant slamming of doors was a little bit annoying. But, like good campers, we didn't do anything to stop their happy family reunion. As a matter of fact we were talking about how much fun this would be for us too if we'd have such a campground family reunion also. We went to bed exhausted, my husband fell asleep, because, the noises had finally stopped completely, but, I could not seem to fall asleep till early in the morning. Then, we were abruptly awakened by slamming of doors again. It was 5:30 A.M. I peeked outside to see where that noise was coming from; it was our neighbors family. I said to my husband, "there they go, playing doors again" he laughed at my joke but was extremely upset. The parents were making breakfast, and a campfire was started. We both got up, opened the curtains, sat for breakfast also, it was Saturday morning. While eating we could see the children going in and out of the car, for showering stuff, then for clothing, then for food, then for drinks, then for shoes, then for combing hair, then make up, then for checking their hair again, etc., etc., slamming the doors every single time they went in and out of their car. I told my husband, "Why don't they leave the car doors opened until they are all done their material needs? " It was a constant mechanical happening. Not only the kids were playing doors; the parents were as bad as their children. After breakfast we stayed up because we were leaving that day for home. My husband was to work on Sunday and then was off for two days again. While eating I just voiced out, I'm so tired I can't see myself going home like this. Let's stay here another couple of days, surely they will leave on Sunday, and that would give you two more days to rest here. You can take to truck and go work on Sunday and come back here after work and we'll have two more days to rest". I added, "I will even pay for one day if need be, and you can go ask the Office to see if we can stay in this site so you will not have to move the camper to another site." My husband was not too keen on leaving the camper behind without him being there at the campsite. He left for a ride to the Mall. I had gone to sit outside in the cool breeze and to my surprise the playing door family started to put their tents down. Some of their visitors came back though but it was only to say their goodbyes. I could not believe my eyes when I saw them putting one tent down. A thought came I would finally be able to sleep tonight, I told myself. Then my husband arrived from his shopping spree and he saw the family gone and had a great big smile on his face. He surprised me by telling me that he had gone to the Office and asked if we could have two more days, then he added, "I asked if we could have the playing doors family site" -since their site was next to a little field that separated their site to the next site- "for a complete restful two days." He added, "I told the assistant at the office, "with all our luck, we'll have someone loud again", and so, the man said "no problem sir, you can move your camper to that site whenever you want; it is yours for two more days!" And he added, "so, were staying until Wed. noon." I was so happy I started to cry, I started to hug him and dance around, "and a double surprise" I added. It took us less than 10 minutes to move the camper to the other site. My husband did not stay the whole day, he wanted to go home earlier he needed to take care of some things, he had said, and left for home. Than left me alone from Saturday 5 PM to late Sunday evening. There is a little Chapel called Ste. Anne about a mile from that campground, and in the summer time there are weekend Masses celebrated there. In order to not miss the Sunday morning Mass I went for a walk to time myself to see how long it would take for me to get to the Chapel. After my walk to and from the Chapel I went to the shore of the Seaway. The shore has a spectacular view of the sunset going down between two mountains. Many people flock that area at sundown daily, but on weekends that area is full of people, families taking walks, sits at table areas to eat their meal. There are playgrounds, swings, and lots of lawn area for "picnics on a blanket", although the areas are busy, it is very quiet. It's a most relaxing atmosphere, romantic, and an awesome sight of the sunset. That Saturday, I sat down at a table to watch the sun go down between the two mountains -connecting one another at their lowest points- after the sunset I then hurriedly went to the camper before it got too dark. I went to bed mentally visualizing the sunset I had just experienced and fell fast asleep. What a peaceful sleep I experienced that night. I woke up by my alarm clock in the morning so I would not miss Mass. I was all refreshed and ready for a most beautiful day ahead of me, a day I never imagined could happened to me. After Mass, I walked up to the camper in a strolling manner; it was an absolutely beautiful sun filled morning. I ate lunch outside, and decided to go for a stroll by the shore. As I started the decent of the extremely steep hill to the shore I could see that the tide was at its lowest. It was the very first time I had seen the low tide there, and there were huge rocks that one could sit on. I decided to walk to the end of the path that is above the shore area, and, on my way back, I could go on the shore itself and sit on one of those huge rocks. I was about at the halfway mark of the path's length where a nice rock was inviting to sit on, I chose that one and sat upon it. Like I said before, the other side of the Seaway has mountains upon mountains scene that are spectacular, the sky was hazy, the wind was blowing softly, not a clouds in the sky, the seagulls were flying around, and the waters would make their moving sounds of to and from the shore. There I was, sitting in this Glorious site that HE had reserved for me to be at on that specific day, and that specific hour reveling all HIS Glorious Creation to me. I so felt close to PAPA DIEU that afternoon. I have no idea how long I had been sitting there in amazement of HIS PRESENCE, the wind blowing on my face, in my hair. The sun warming my face as the wind ceased its refreshing breeze an instant, or two. I was in what I now call a "connected trance". It was as if I had left all the happenings behind me in a moment's time, as if I was the only person in the whole area, and I possessed it all. I remember I was crying, even talking out loud once in my Praising HIM for the feelings of being so important to HIM at that very time and place, for the Glorious sights I was in the presence of. 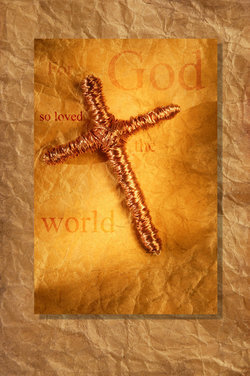 I sang, I prayed, I cried, I pleaded, I promised, I offered it all, and I thanked HIM with tears and songs. I had been sitting on a rock and I do not remember it was hard. I was in complete awe, awesome awe. I remember talking to HIM as if I would a dear friend and it felt like HE was listening to my every word. Then, a car's horn brought me back to the real world, to my surroundings. And then realized that the tide had come in quite close to me, about a foot from where my feet were. I remember I was very sad that I had to leave soon, that I would never be in HIS Presence like I just had, ever again. I suddenly became very sad to tears. I started to look at the water coming in and told myself; "when the water is up to my feet I will leave, not until then". I started to look around me and right in back of me on the lawn area, there was a man sitting on a picnic table that was parallel to where I was sitting and that concerned me, seeing him looking at me like he was and so I decided it would be better if I would go before the water would be up to my feet, since I had no clue as to how long that tide would bring the water to that level. But, before I started to stand, I asked; "PAPA DIEU, were YOU truly with me here? Were YOU truly here listening to me? 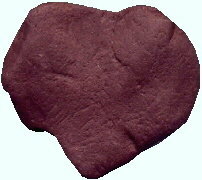 If YOU were, I would like to find a stone shaped like a heart". I then realized what I had just wished for and testing HIM was not right for me to do, to judge HIS Presence with a heart shaped rock! "Who am I to ask HIM such a thing, I told myself". But, it was as if I needed to be sure HE had truly been there with me the whole time I was sitting on that rock. I then added in my mind; "well if not a heart shape, maybe a cross shaped rock!" Again, I realized I was asking for the moon, but, I started to look around where I was sitting for the rock of HIS "yes I was here with you" rock. The shore area where I was had brownish red, dark grey, light grey jagged rocks coming out of the ground and in between those jagged rocks were little pebbles. 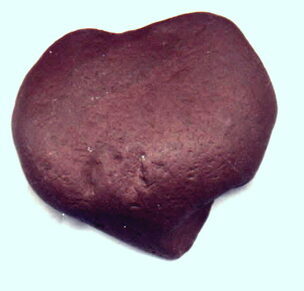 I took a few that were round on one side, thinking it may be a heart shape, but did not find one of that shapes. Then I looked in back of me and again that man was still sitting on the table and looking at me, and it gave me the creeps at that moment. I also saw that there were stairs to go to the lawn area right in front of him, but there was no way I would use those stairs to go off the shore and to the camper. So I decided it would be best if I'd leave before something happened to me and I spotted another set of stairs at the end of the shore area, which was parallel to the hill to the campground. So I started to walk to the far off stairs and continued to look for a heart shaped rock. I remember telling PAPA DIEU, "It's okay if I don't find a heart shaped rock now, I know YOU were with me all this time, there is no way I could feel the way I just did without YOUR Presence here". I continued my stroll to the stairs still looking on the shore at the rocks. A little way off in front of me, was a brown/red rounded top rock sticking halfway out of the sand I took it out of the sand and the sand was clinging around it in a big clump so I went to rinse it in the water. And there, in my hand, was a three dimensional Heart Shaped shaped rock!!! Of course the tears welled up as my eyes and hand were seeing and touching "a real shape of a human heart shape like rock. The more I looked at it the more I was seeing new things on it and then to my utter disbelief, the rock had marks on it, and one mark looked like a cut on the left side of the rock. By now, I was realizing that I was crying and, that there were people looking at me on the shore, not seeing me cry but just looking towards me. I had to compose myself to get up the stairs and walk to the camper. I felt like screaming and yelling at the top of my voice to show everyone what I was holding in my hands, and, tell them what I had asked for as proof that PAPA DIEU had truly been with me on the shore, but I would have been branded a fool, Im sure. I arrived at the camper and washed the stone and saw that the mark on the side was deeper than I had seen on the shore. I then started to cry like a baby in the camper. I was in disbelief that I was given so much love from PAPA DIEU. I even told HIM how foolish I had been to ask HIM such a thing as to prove that HE had been with me. I cried myself to sleep that night holding that Heart shaped rock, and many nights after that day.